3 bedroom, 3 bathrooms with hill views, very quiet and homely. Greystones is an ideal cottage for a family or group of friends. It benefits from a fully enclosed garden for peace of mind if you are bringing dogs, as well as a patio dining area right outside the front door. Greystone’s is a traditional Yorkshire Dales holiday cottage in Swaledale, situated at the end of a private road in the popular village of Reeth. This dales cottage is in a prime location to access all the village amenities as it is just a minutes walk from the attractive village green. Greystone’s is heated throughout by Biomass heating and offers free WiFi access. Walking straight into the spacious sitting room with log burning stove and 43" smart TV, you will immediately feel at home. Off the sitting room is a boot room with washing machine, plenty of space for outdoor clothes, and a downstairs toilet. The newly fitted kitchen and dining area is bright, spacious and fully equipped with everything you should need during your stay. There are French doors into the back garden, which is fully enclosed and has direct access into the field behind the cottage. The sleeping accommodation upstairs is also spacious and comprises of a two super king bedrooms that share the main bathroom, and a super king bedroom with en-suite shower room. The main bathroom boasts a lovely double sink, luxurious deep bath and a separate large rainfall shower. Greystone’s is a dog friendly holiday cottages, well behaved dogs are welcome. The cottage is an ideal choice if you are looking for pet friendly accommodation as there are many good dog walks nearby, including Fremington Edge which is literally on the doorstep. To ensure your stay is as comfortable as possible, all kitchen linen, bed linen and towels are provided and the electric and heating are included in the rental price. There are 3 other cottages that can be let at the same time for a larger group. All cottages are next to each other. These are Burton House, Turbine House and Charlie's stable. Advertised on this website. Although these cottages have been in our family for over 100 years, we have only just taken them over to run as holiday homes. My mum set off with them as holiday homes in 1991 and ran them very successfully until her death in 2012. My husband David and I live in the village with our two girls and we are always on hand to answer any questions or advise on which pubs to eat in, or where to get the best views on a walk! We are working hard to get the cottages and outside areas up to a very high standard and are both enjoying the challenge that all this has brought into our lives. We hope you like the look of our properties enough to book with us, and we can welcome you into our little haven in the glorious Yorkshire Dales. Spacious Kitchen diner with comfy bar stools at the kitchen island, a Robert Thompson "Mouseman" dining table and six chairs, and a sofa too for the ultimate entertaining space. Reeth is an absolutely beautiful village. Greystones Cottage was what I expected an English cottage to be. It was sweet, comfortable, and had all that we wanted and needed. A quiet spot in a lovely village perfectly located to explore the Dales. We were very content here and felt the place was being well cared for. I hope to return within two years time and plan on renting one of the three cottages available. Recommend Tan Hill pub and a drive to Bolton Abby and beyond. Thank you for leaving us a review. It was a pleasure to have you staying with us for a week and we hope to welcome you back again soon. A characterful property in great location and very spacious for us and our dogs. The boiler stopped working one day but the owners sorted things for us immediately so we were kept warm and cosy and had hot water. We have happy memories of our short stay and would definitely stay there again. But even so we really enjoyed our weekend there, and the weather had been very cold with a touch of snow. Take some extra layers if booking in the winter! Thank you for taking the time to leave us a review. We are saddened to hear that you found it cold. If you'd dropped us a message we could have come down to sort it for you. I had put the heating on constant to get it warm for you coming, as I knew it would be a cold weekend. There are plenty of extra blankets and duvets in the cupboard in the twin room. Perhaps you could let us know where the drafts are coming from as we have just installed double glazing to rectify the problem but it obviously still needs to be addressed. We take all comments seriously, to improve your stay. Sorry we haven't been able to help you while you were with us. Kind regards, Rose. Excellent cottage in a very quiet but convenient location. We had an enjoyable stay at Greystones. Our host was very friendly and welcoming and conveniently lives in the village. The cottage is very comfortable with 2 bathrooms and well equipped kitchen. It is warm cosy and spacious. The wi-fi was useful as we had no phone signal in this part of Swaledale. 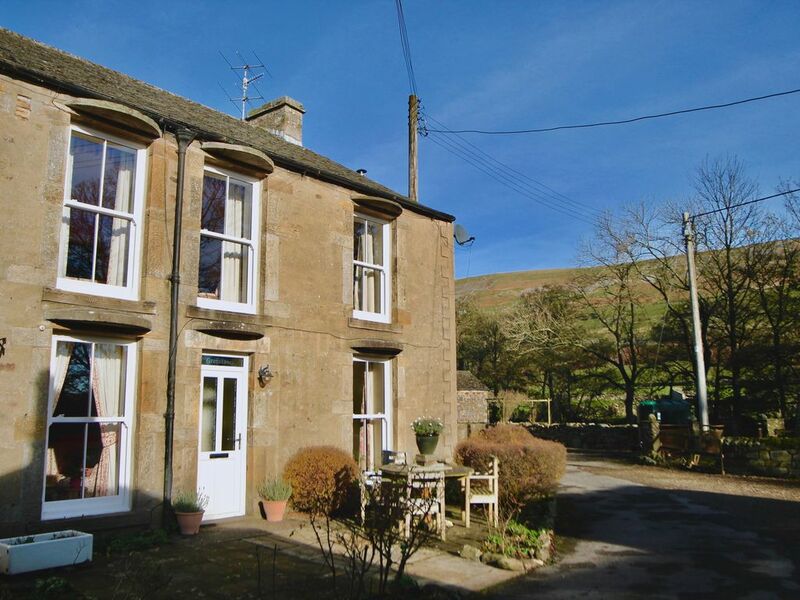 Greystones location is in a very quiet part of Reeth but still close to the pubs, restaurants and shops. Plenty of parking spaces just outside the door. Thankyou Keith for a lovely review. We are so pleased you enjoyed your stay in Greystones. It was great to meet you and Jean and we are looking forward to welcoming you back soon!